July 2 marked the 75th anniversary of Amelia Earhart’s disappearance. Her unfinished story is marked by missing wreckage and a frustrating mystery that continues to haunt and fascinate historians, salvagers, fans, and dreamers all over the world. 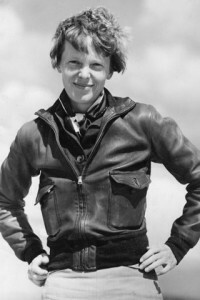 Since Earhart’s attempt at becoming the first female pilot to circumnavigate the globe, she has become both an American icon and role model, especially to girls and young women. On July 3, a group of explorers departed from Honolulu for Nikumaroro, a coral island in the Pacific that is part of the Republic of Kiribati. Their mission is to explore the area around the island, where they believe Earhart and Noonan may have landed and possibly survived for a short period of time, perhaps waiting for a rescue team that would never come. There are many theories about what happened to Earhart and her navigator; this one has been revived thanks to new analysis of a 1937 photo which is believed to show a piece of landing gear from Earhart’s plane. Archival research and several other artifacts found on the island contribute to the evidence for this theory. The expedition is privately funded and led by the International Group for Historic Aircraft Recovery (TIGHAR). You can learn about FedEx’s philanthropic involvement with this project at their blog, and hear more at an NPR All Things Considered story. “Amelia Earhart may have been an unlikely heroine for a nation down on its luck,” Hilary Clinton said at event in March celebrating Earhart and the United States’ partnership with Pacific Island nations, “but she embodied the spirit of an America coming of age and increasingly confident, ready to lead in a quite uncertain and dangerous world.” We hope that the exploration will help us complete Earhart’s story. You can find updates and briefings about the expedition at TIGHAR’s website. This entry was posted in News and tagged #amelia earhart, #american icon, #first women. Bookmark the permalink.